I got feedback from my earlier LED lamp prototype asking why not just use a “white” LED instead of monochromatic red/blue. After all – I was told – the efficiency of white LEDs have improved over the years. The goal of this post is to describe my latest LED lamp prototype that is based on using a fuller spectrum LED instead of just using monochromatic LEDs of red and blue on the plants. I am learning a lot about growing agriculture in a controlled environment by taking Dr. Kubota’s course: Greenhouse Plant Physiology and Technology. Thank you for the fascinating and useful knowledge you are guiding us to learn. I enjoy and learn from the hydro subreddit. A special thank you to SAG for sharing his (I assume his because G is for “Guy”) knowledge. Eerie looking, right? The light that is emitted is not a very welcome site for the family to gather and talk around. On the other hand, the red/blue combo makes sense from an efficiency perspective – particularly if a plant’s use of light considers only chlorophyll. The primary reasons why LED fixtures emit a lot of red are 1) red LEDs are among the most efficient at converting electricity into photosynthetic photons, 2) chlorophyll strongly absorbs red light, thus it is effective at photosynthesis, and 3) red LEDs are relatively inexpensive. Many plants grown under only red light, such as plants grown indoors under only red LEDs, have a stretched, elongated appearance; the leaves are thin and large and plants become tall. In most cases, plants grown under only red light do not have desirable growth characteristics. However, when a relatively small amount of blue light is added to red light, extension growth of plants is inhibited. Therefore, plants grown indoors with 80 to 90 percent red light and 10 to 20 percent blue light are quite compact, with smaller leaves and shorter stems. It is the biggest basil leaf I have grown…although I am new to paying attention to my gardening results in any detail. I have tight control on the exact wavelengths (quality) and quantity of red/blue LED lighting. This tight control allows me to see for myself how the red/blue affects plants. I learned a lot building it. From figuring out which SMT LEDs to use, to getting the tiny MCPCBs (Metal Core Printed Circuit Board), to using a CPU heat sink, etc…gathering the parts and putting the pieces together is an accomplishment I am proud of. I absorbed more about using LEDs as the sole source of light for plant growth. An abundant amount of herbs and veggies can be grown with just red/blue LED lights. The combination of red/blue is not pleasing to our eyes. I’m growing plants in my kitchen/home. While my DIY efforts work, I am concerned with replicating even in small batches for the rest of my family. Besides potential robustness problems, they are not aesthetically pleasing. It takes me several hours to put the LED lamp together. In some ways the time spent is relaxing, but I question if it is the best use of my time. I listed out all components to make the red/blue LED here. In the BoM below, I took out components for the lamp as well as the buck converter. It turns out the CPU heat sink is “good enough” without needing a fan. The price for just the red/blue LED is $47.40. Indeed, not only is the 3000K LED pre-assembled, at $16, it costs far less. For my latest prototype, I am using a flood light that has a 3000K light quality. I chose the 3000K light quality because the spectrum quality of light appears to be a pretty good match to the McCree curve. Yes, red and blue are very efficient….but note photosynthetically active radiation includes not just red and blue – there are other activities going on within a plant leaf that is triggered by light. McCree’s work brilliantly shows this. McCree showed if a single leaf is analyzed as a whole system (i.e. : besides chlorophyll, there are chloroplasts and carotenoids…as well as other actions I am not that familiar with…), the entire PAR range is used. I got the most appropriate light from my local Home Depot – the Cree 810048029488 PAR 38 flood light. Once I got home I had a chance to look at reviews of this bulb. The bulb gets low reviews because too many have burnt out after several months. It should work fine for the prototype. The packaging states the LED uses 18W and has a light output of 1,500 lumens. The cost was $16. The screw fitting (E26 medium) is the most common size used on bulbs in the US. This makes it easy to use many different lamp bases. I found a desk lamp that was no longer used and made a clamp for it with my 3D printer. Talk about a YIPPEE! moment…I thought of using the 3000K LED light and sometime later the same day I was taking the PAR value and starting to use it on some tomato seedlings. Whoa..the PAR values exceed what I was getting with my first LED setup. Now it is time to grow plants with this light. I’m starting with some tomato seedlings. I may switch over to growing a leafy herb or vegetable. Detecting Chlorosis Using Image Processing. I woke up awhile back extremely excited to answer the question if I could use a picture and image processing to help isolate nutrient deficiencies or toxicities. All the while thinking if I mentioned this to my family they would say something…”can’t you just look at the leaf?” Yes family. You are indeed right….and yet…I bumble onward in this effort. Still – ever grateful (seriously) that my family cares enough to ask! I crave the thrill of learning how to do something I am clueless about. And who knows…down the road this knowledge might come in handy. While plants are poor communicators, they do offer visual clues when they are getting not enough or too much of a nutrient. One of the big visual clues is when all or part of a leaf turns yellow. This is known as chlorosis. The goal of this post is to take an image of a leaf and have my Mac tell me the overall and localized level of chlorosis. The code will work but probably just barely. It will be a sacrificial draft. The folks behind the ImageJ and Fiji software, especially Wayne Rasband, the NIH, and the large community of folks that improve on this valuable resource. Dr. Mark Chopping, Montclair State University and Dr. Ved Sharma, Albert Einstein College of Medicine. These two wonderful folks answered a question I had on how to create selections based on quadrants of the images. Dr. Chopping led me to understand how getting the bounding rectangle (i.e. : run(“Set Measurements…”, “area bounding redirect=None decimal=2”);) is critical to finding these quadrants. Dr. Sharma pointed out to get only the leaf pixels in the quadrant is a simple task of taking the intersection of the leaf selection with a quadrant. Dr. Paul Fisher for teaching the excellent University of Florida’s Nutrient Management 2 (Advanced). This post uses the knowledge I gained within the course. The ImageJ macro and images used in this post are located at this Github location. The color analysis algorithm I will use was proposed in the article Smart Sensor for Real-Time Quantification of CommonSymptoms Present in Unhealthy Plants . Divide an RGB image of a leaf into four quadrants at the leaf’s centroid. Figure out how yellow each quadrant is. 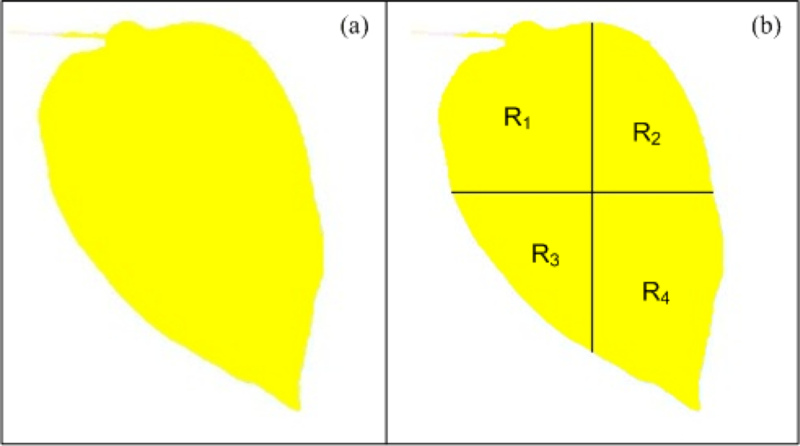 Figure out if the yellow is localized to a quadrant or is all over the leaf. I will use the definition of Yellow that was proposed in the paper: Yellow = The average of the pixel’s (.5)Red + (.5)Green values. gives an example of the chlorosis detection algorithm in action. I’d like to run as many leaf images as possible. It would be very helpful to get images from you. If you are interested, please send the images to happyday.doctorladybug@gmail.com using the image capturing technique described in this section. I will send you back results values from the analysis. It took me a few tries at different techniques in order to create an image. I ended up using the white screen of an iPad as background. It is important to get the screen as clean as possible! I opened the Notepad app on the iPad and got most of the iPad’s screen to show a note on white background. Next I put the leaf on the iPad. I put some care into flattening the leaf so that the leaf laid relatively flat on the screen. After turning off the overhead lights and minimizing any reflections, I took a picture of the leaf with my iPhone. This technique provided a contrast between the background as well as a backlight to bring out the leaf’s color. There is a super amazing open source software tool available to all of us – ImageJ – thanks to the excellent work by Wayne Rasband, the NIH, and the community. I used ImageJ as well as Fiji to get the yellow values needed to figure out the amount of chlorosis. I preferred Fiji for the majority of the programming. Unlike the ImageJ editor, the Fiji editor is language aware which makes editing much easier. On the other hand, ImageJ has a source level debugger that lets me step through the code. Stepping through the code is an immense help in understanding what is going on as well as where an error is lurking. Yet, Fiji has bundled in a lot of great things into the development environment that make it much easier to get stuff done because the additional plug-ins and such are part of Fiji’s installation. I almost always used Fiji except when debugging. The challenge here is if I modify the script in ImageJ, Fiji won’t read the file. I got around this painful challenge by copy/pasting the code between the two editors. The ideal environment would have ImageJ’s debugger part of the Fiji environment. I’ll refer to both packages as ImageJ during discussions. I used ImageJ’s macro language and GUI. The experience is messy since windows with images at various processing states appear and then are closed. I would imagine if I evolve this project that I will move off any GUI to a command line execution. The steps below are a high level discussion of the ImageJ macro code found at this Github location. The first part – defining the leaf quadrant selections – create selections based on a threshold set on the pixels. Each selection/ROI can then be analyzed. The first part divides the leaf pixels into four quadrants at the centroid. Get the GUI focused on processing the leaf image. If there are any windows open showing images or dialog boxes, close them. Get the path and filename of a leaf image from the user. filepath=File.openDialog(“Select a File”); : openDialog opens the file picker dialog. Go to the folder holding the image and click on the image. Open the leaf image in a window. Create a mask from the leaf image and figure out an outline around the leaf – in ImageJ this is called a selection – in which the pixels inside the selection are part of the leaf. These are the pixels that will be used to figure out the leaf’s yellow amount. selectLeafMask() : A mask is created by setting the threshold color. The threshold color defines what HSB (HSB is the same as HSV) a pixel needs to be in order to be included within the mask. Getting the color threshold “right” for all leaves is an area of further exploration. There is a good chance for false positives – the case when multiple areas are determined to be within the color threshold. In the case of multiple selections, I check to see which has the largest area and assume that is the leaf. I got the macro code by ImageJ’s macro recording feature. I turned on the macro recorder in Fiji, opened the file, went into the threshold color dialog box. I then set the Hue, Saturation, Brightness values. Now that I had the recorded code, I copy/pasted it into the selectLeafMask() function. Create four more selections based on a bounding rectangle of the leaf selection and the centroid of the leaf. This gives four quadrants that includes the parts of the leaf but also some of the white background. The pixel calculations should not include any of the white background. To just have leaf pixels in the selection, create four selections that do not include any of the white background. This is done by taking the intersection of the leaf selection with each of the four quadrants. The second part calculates the Yellow values. Finally – it is time to figure out a leaf’s relative amount of generalized or local chlorosis. Rk is the average yellow pixel value of the k selection (where k = 1-4). Rn sums up the four Rks to give a relative value to the amount of chlorosis. Rdiff gives a relative value to the difference in chlorosis values between the four leaf quadrants. The Green Basil Leaf has the lowest Rn and Rdiff. This visually makes sense. These values are around the range given in the article’s figure 13.a for a low-generalized and low-localized chlorosis. At an Rn of 544 and Rdiff of 62, the Unhappy Spearmint Leaf analysis gives numbers for a localized chlorosis. The first leaf gathered on a walk I went on gives numbers for a small amount of generalized chlorosis while the second leaf gathered points to a higher level of generalized chlorosis. That was quite a learning mountain climb for me. Along the way I was delighted to learn about ImageJ, a potential algorithm for analyzing an image of a leaf for chlorosis, and felt a large amount of gratitude for those that took their time to help. Will I continue adding other refinements (such as inter veinal chlorosis detection, necrosis, etc.) or evolve the code? I sure would if there was a practical reason to do so. I definitely want to test what I have on other leaves to evolve the robustness. Here is a short video on my latest hydro setup. Right now I’m growing six plants. The plants were started from seed a little less than three weeks ago. I will replace measuring pH and EC as well as adding nutrients once I get the Ladybug Shield ready for the task. Let me know what I could be doing better. That’s it for now. Please find many things to smile about! Chris noted at the beginning of week 3 of Contextual Electronics the value of knowing the design behind a circuit versus settling for a complete solution from a 3rd party. In my case, I constantly wonder – how the heck does the pH sensor figure out the pH? And the complimentary question – same for conductivity! My highest priority in my DIY hydroponics station is “support free.” After shipping software for over 20 years, I realize this is impossible. However, it is an important principle. It is always better to have intimate knowledge of what I am building. Besides – it brings me a YIPPEE! MOMENT – so much to learn. an intuitive feel for what measuring pH is all about. a strong grasp of the parts that go into a pH measuring circuil. Get you engaged so that together we can build and learn together. discussing what pH values mean to a plant’s health. This is covered in other posts. a working prototype. This post focuses on getting to know the pH circuit. Learning is amazing. How extraordinary to be able to learn from others who willingly share their knowledge. THANK YOU! For knowledge is indeed more powerful than currency. And community learning is indeed more powerful than a textbook. EME Systems for a great article on the hows and whys of a pH circuit. @SparkysWidgets – I bought a pH circuit. 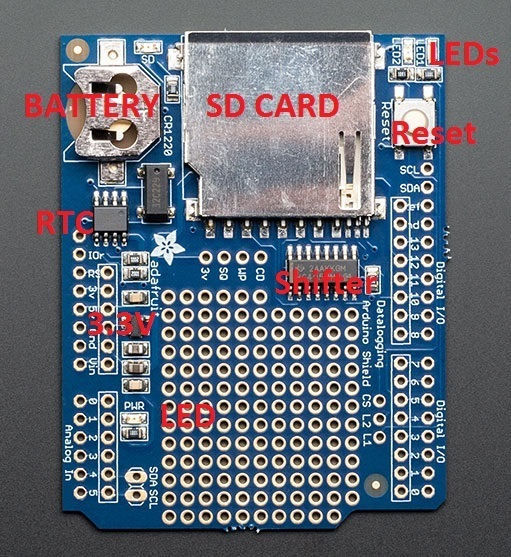 His phSensor schematic and blog post is all you need to get started. Because I lack the background in electronics, I didn’t understand much of the post at first. This got me writing out what I learned here. The pH Pages – useful info on how to build a pH sensor. Chris Gammell – our very knowledgable and gifted instructor of Contextual Electronics. A course I would highly recommend if you are interested in turning your prototypes into PCBs and learning tons about electronics along the way. The more time I spend with Chris, the more I realize what an exceptional person – both in knowledge and in ethics – he is. Chris is amazing at clarifying circuit concepts! Dave Jones for his excellent videos on different aspects of stuff we need to know about electronics. The recent one on Op Amps is terrific. The Hydro subreddit. Thank you to all the knowledgable folks who kindly share their experience and what they have learned. The AskElectronics subreddit. Thank you for answering questions that might seem obvious to you. Again – thank you. It is a much better learning environment than what I remember 20 or so years ago. At that time, it seemed we took “knowledge is power” to be ME motivated and not understand shared knowledge is far more powerful than ME knowledge. Not knowing much about the innards of a pH measuring device, I spent a bit of time reading up on what the heck makes these things work. It turns out a pH measuring device consists of a probe and a voltmeter. My apologies if you are rolling your eyes at this obvious conclusion. Up until now, the pH was just a number on a spreadsheet. Now I am constantly wondering why? I’m loving the mix of life, chemistry, electronics, math and programming. But there is a good chance you have already enjoyed learning all this – probably in 5th grade science… For others who didn’t learn this stuff but are now interested, I’ll summarize what I learned. The probe is a glass electrode. It measure the hydrogen ion (H+ ion) concentration in a liquid. The image and a better explanation can be found on this post. When the probe is put into the liquid, the H+ ions move toward the glass electrode. This creates a tiny current which is what a pH sensor measures. More H+ ions scurrying about means a higher voltage, which means the liquid is more acidic. Lower – more basic. When I look at it that way, I can see the comparison between a pH probe and a battery. Like a battery, a pH probe generates current. A pH probe does this by getting the H+ ions to scurry about. Like a battery, the voltage can be measured. Voltage of electrodes is measured using the Nernst equation. This equation is used to validate that a change in 1 pH unit occurs when the voltage changes by -59.16mV. pH values can range from 0 (high acidity) to 14 (strong base). Given the pH range and the voltage change (59mV) per pH unit, the range of voltages the pH probe will read is: +/-7*59mV or +/-413mv. At pH 7 (neutral pH) the probe produces 0 volts. The amount of volts between pH units depends on the temperature of the solution. -59.16 mV assumes the solution is at a temperature of 25°C/77°F. Googling for the temperature coefficient returned -0.1984 mV per °C. That makes the slope -54.2 millivolts per pH unit at 0°C, and -74.04 millivolts per pH unit at 100°C. Like a battery, the voltage potential for the gas probe weakens over time. An accurate reading should calibrate the pH readings to accommodate the degradation of the signal. To calibrate, I need a solution known to be at pH 7 and one known to be at pH 4. Every once and awhile – say every two weeks, – I must take a reading for these know solutions and adjust for temperature. If the voltage of the known solutions is not 0 V for pH 7 and (59.16*4) .237V for pH 4, the readings need to be adjusted to these variances. the voltage produced by the pH probe can be read from an Arduino Uno’s digital i/o pin. “fairly accurate” readings. A pH of 5 is only 59mV from a pH of 6. That is a very small amount of differential voltage to measure accurately. This is because the pH probe is made of glass which creates a very small electrical current. This means it has a very high output impedance, typically around or more than 100MΩ. SpakysWidgets notes: “A typical probe has an impedance of anywhere between 50MΩ and 500MΩ, and since 100MΩ*1nA=.1v even having a single stray nano amp can throw our measurement off by almost 2 entire ph units.” In order to get a meaningful reading, the design must eliminate most noise and outside disturbances. one op amp will isolate the circuit that will be measured from the circuit that is providing the reading. This will go a long way in preventing disturbances from being introduced by the pH sensor. one op amp will amplify the signal so that it can be read by the Arduino’s digital i/o pin. high input impedance – meaning the op amp will draw as little current as possible. This will also help minimize changes to measurements because of the parts used. an ADC to convert the incoming analog signal into a digital signal that can be read by the Arduino Uno. a charge pump to handle the -5V readings when using Arduino’s 5V as the power supply. some capacitors to filter out noise. Why reinvent the wheel? Besides, at this point in my learning I am still being introduced to components and what they do. I decided to learn the design of the circuit by walking through SparkysWidget’s schematic on GitHub. In this section I will walk through the components I mentioned before. adjust the pH signal so that it can be read by an Arduino (through an ADC). filter out noise in the pH signal. The diagram I came up with helped me to understand what is going on. Even though SparkysWidgets said these things, I didn’t grasp what was really going on until I broke the steps down. The process helped me better understand the fundamentals of an Op Amp. I’ll explain what is going on in each step in case it helps you. 101 – simplified “behind the curtain” drawing using standard drawing of a non-inverted op amp. behind the curtain – pieces of the schematic come from SparkysWidgets schematic in GitHub. Gain = V(out)/V(in) = 5.7. Or V(out) = 5.7*V(in). When the pH of the solution is 0 (strong acid), V(in) is .414. When the pH is 14, V(in) is -.414. Given the pH probe uses glass, it’s pretty hard to get a great signal. On top of that, there is inevitably going to be some noise. The standard way this gets handled is to put a low pass filter in the circuit at the spot it works best to pluck out the noise. This is why SparkysWidgets schematic includes the 1uF capacitor on the gain op amp. The capacitor’s impedance decreases with increasing frequency. This low impedance in parallel with the load resistance tends to short out high-frequency signals, dropping most of the voltage across series resistor R1. The spikes (noise) gets swallowed up by the capacitor since as the spike is winging through the circuit it wants to travel the path of least resistance. When it has a choice between The path with the resistor and the capacitor with a low impedance, its going to choose the capacitor path. As obvious from its acronym, the ADC takes in the shifted analog signal coming from the shift op amp and digitizes so the Arduino can interpret a value. Most pH charts like this one need one decimal point resolution. I want to be able to read a pH of 7 and a pH of 7.1 accurately. I don’t need to distinguish between 7.12 and 7.13. I noted earlier there is -59.16mV per pH unit when the temperature is 25°C. The signal was then amplified by 5.7. This changes the amount of voltage between pH units to -59.16*5.7= -337.212mV. A pH value of 7.1 occurs at 33.721mV per .1 unit of pH. Given that, an ADC with 8-bit resolution should be good enough. Why won’t You use Arduino’s analog inputs? I’ll start with using the Arduino’s ADC and see if it is “good enough.” For now I think it is. Using the Arduino’s ADC will save a level of complexity since I don’t have to think about I2C or SPI to communicate with the ADC as well as lowers the BoM. If I were to use a separate ADC, I could use Serial, I2C, or SPI to communicate with it. I’ve used Serial communications on an Arduino enough to feel I can get better accuracy over I2C or SPI. I chose I2C because of this digikey search. ADCs with the SPI interface were $1 or more than ADCs with the I2C interface. It looks like the difference is a higher sampling rate for the SPI bus. This makes sense because the SPI is a faster bus than I2C. However, the sampling rate offered by ADCs using the I2C bus to communicate with an Arduino are fine for my needs. A goal is to save on the BoM where it makes sense to do so. In this case, using the I2C bus makes sense. I’ll compare results using the Arduino’s analog input with the same part SparkysWidgets uses – the MCP3221. The cost is $1.73 for a quantity of 1 on digikey.com. The default clock speed for the I2C bus on an Arduino is 100KHz, which is plenty fast enough. Figure 6.2 of the data sheet recommends 10K pull-up resistors for the SDA and SCL lines. mash_taiters noted out a good “rule of thumb” : you should always include decoupling capacitors to the supply pins of ICs (usually 0.1uF). They are cheap, small, and will save you headaches. These words of advice are retold in6.4.2 of the data sheet: A bypass capacitor from VDD to ground should always be used with this device and should be placed as close as possible to the device pin. A bypass capacitor value of 0.1 µF is recommended. Adding this capacitor should handle any noisy spikes. a stable reference voltage to measure the input/output voltage. a simpler/more exact mapping from analog to digital. I am assuming – I may be wrong – that using VDD instead of including a voltage reference IC like the MCP1541 ok for this application. I’ve concluded the schematic SparkysWidgets has provided to us is very close to what I would create given my new found knowledge. So I’m just going to reference this one. THANK YOU SPARKYSWIDGETS! Thanks to those that have gone before, I found it wasn’t that overwhelming to build a pH sensor circuit. The firmware still needs to be written. This won’t be too difficult given the large amount of information folks have shared. Amazing. I thought I knew more about Op Amps than I did. It took me a surprisingly long time to figure out what the op amps were doing and how they were doing it. Even with the information SparkysWidgets provided. My challenge is interpreting what is being said in the context of my new to circuits context. I post this in case others might be in the same learning boat and could benefit from my interpretation. Also, I am hoping folks will correct errors I have made or suggest improvements to be made. That would be spectacular! I need to prototype this circuit so I’ll be ordering parts and laying them out on a breadboard. While I am waiting on parts, I will be delving into building an EC (conductivity) circuit. I am assuming the two circuits will be similar and am excited to find out. Breaking down what is going on, an analog measurement is made then amplified. This must mean an OpAmp is going to play an important role in the circuit. The analog signal is converted to digital. Seems like I’ll need an ADC. Finally, a conversion function is needed. Here is where the math comes in. I am not strong at math so I thank Sparky for coming to the rescue. By the way – if you are like me and new to using OpAmps, I highly recommend Dave Vewers’s Youtube video (TBD: link and name of video) . By watching this video you get the added bonus of learning what a “dill” is. For each pH step we see a ten fold concentration change, for example a pH of 8 has 1/10th the ion activity as a pH of 7. No wonder my cucumber plant’s leaves turned yellow when it’s pH was off by over 1 step. The poor plant was not able to take in the proper amount of nutrients. I can see why maintaining the correct pH level is so important to the health of a plant. All this really means is when the concentration is greater on either side of the probe, the ion flow will induce a slight voltage between the probes electrodes, this voltage can swing both +/- which will indicate either an acid or base. generates -59mV/pH. Given that, the effective range is +/- .059*7 volts or +/- .413 volts. But wait – temperature and using a worn down probe need to be taken account when making a reading. I don’t know how yet. Sparky is building up the suspense! While we were designing the thermocouple in Contextual Electronics, Chris walked us through the data sheet for an LM324 OpAmp. A very basic design we can utilize is a simple unity gain amp, a buffer circuit to separate the high impedance probe from our “low” impedance multimeter. We will build this design first for a couple reasons, the first being it is an effective way to compare our probes to the ideal probe model. the second reason being its really easy to build and can take only a few seconds, and demonstrates a base for how the offset(in an inverting config) will alter the signal. While I suppose you could use an LM358 for this I would recommend at very least the ST TL072 or a CA3140 this is to be sure not to load down the probe and get false readings. In analog synthesis, to generate almost any signal with op amps, it is necessary to have positive and negative voltages. This allows the op amp to generate a signal that spans positive and negative voltage values. And there it is – a YIPPEE MOMENT! convert the analog measurement to a digital measurement. Apply an algorithm that takes the digital measurement and interprets it into what I am monitoring – in this case the pH value. The pattern is the one I learned in the Contextual Electronics when we designed a circuit for a thermocouple. For the pH sensor, I want to take an analog measurement of a voltage change that has units between 0 and 14. This is not the same as what I can measure with my Arduino circuit, which is 0 to 5V. Speaking electronics, the pH on the left side is the voltage. The job being done. If I don’t do this circuit, what additional work would I be doing? The more I think of this in terms of energy I would have to spend, the more I am able to focus on the most time consuming and least desirable tasks. I guess being lazy has its advantage when it comes to design! A block diagram. The block diagram gives me a very high level map of the modules that are needed to complete the job. I’ll keep taking it down a level until I’m at the wire-connecting-to-chip level. A Fritzing diagram. The prototype uses a breadboard and jumper wires. Fritzing provides a better visual and has more components for breadboard drawing than does the ECAD (?) tool I use – Kicad. (TBD: LINK TO KICAD). The water node reports readings and adjust the contents of three different chemistries (pH UP, pH DOWN, nutrients) in the nutrient reservoir. report the readings of the water temperature, pH, and conductivity when it is requested. Adjust the pH UP or DOWN when given a command to adjust to a pH level. Adjust the nutrients when given a command to adjust to a range of PPM. The green LED is on when the prototype is first plugged in. I then will use PWM to set the LED to 1/4 the full strength. The LED will go to full strength when data is being taken or sent and then return to 1/4 full strength. I broke the prototype into chunks. Testing first then adding on another chunk. I started with the LED because this is Arduino 101 stuff. I used the Fade sketch that comes with the Arduino IDE. I then wired up the pH sensor. I detailed how I did this in an earlier post. The pH circuit uses a serial interface. This requires a TX and RX pin on the Arduino for sending and receiving data. As shown in the Fritzing diagram, I put a yellow jumper wire between pin 13 on the Arduino and the breadboard hole. This serves as the TX line from the Arduino (RX line from the pH circuit). A green jumper goes from pin 12 of the Arduino to the TX pin of the pH circuit. So pin 12 is the RX pin from the Arduino. I used Atlas-Scientific’s sketch to test the circuit. I am not testing the probe at this time – only the circuit. I sent several of the commands listed in the Atlas-Scentific data sheet for the pH circuit. Next I wired up the EC sensor. As with the pH sensor, I covered how I did this in an earlier post. A pro of using both circuits from Atlas-Scientific is they are identical in pin outs, use a serial interface, and use the same commands. Once I figured out how to work with the pH circuit, I already knew how to work with the EC circuit. This allowed me to use the same sketch I used to test out the pH circuit. The only change was setting pin 10 as the TX pin on the Arduino and pin 9 as the RX pin. Now I have two chips that use the serial line to communicate. As I pointed out in the earlier post, the serial library does not multiplex. I’ll use a similar solution to what I did earlier. Answer: Start out with one milliliter per gallon. Wait 15 To 30 minutes, and test your water again. Frequently you will only need 1 to 2 ml of pH Up/Down per gallon of water. You may need additional pH Up/Down if you have hard water. The General Hydroponics Flora Series is pH buffered to facilitate keeping the pH in a favorable range. You might consider just reading SparkysWidgets post (I’ll refer to this post as Sparky in the rest of this post. Awkward, but I do not know the person’s name behind the post. )and ignoring the rest of this post. It does a great job covering what a pH sensor is. Sparky’sWidg. However, my interpretation might help others that learn through a similar lens that I use and documenting my interpretation has the added advantage of jogging my memory when I need to do so in the future. The SparkysWidgets post (I’ll refer to this post as Sparky in the rest of this post. Awkward, but I do not know the person’s name behind the post.) is a great source for getting the context of how a pH value is measured from the scientific and math viewpoint. takes an analog measurement of the voltage change between two electrodes. This is a small value, so..
the measurement is amplified to be measurable within the range of +/-5V. the amplified value is converted from analog to digital so that the Arduino can read the value. the Arduino through an Arduino sketch reads in the +/-5V value. The “secret sauce” is the conversion function. In theory, a pH probe produces about 59 millivolts (mV) per pH unit, and at pH 7 (neutral pH) the probe produces 0 volts. Acid pHs produce negative voltages. Basic pHs produce positive pHs. pH values can range from 0 (high acidity) to 14 (strong base). Given the pH range and the voltage change (59mV) per pH unit, I can now calcite the range of voltages the pH probe will read: +/-7*59mV or +/-413mv (.413 volts). My pH sensing circuit needs to read the value the pH probe receives, magnify the reading to be within the +/-5V range, convert it to a digital signal and then then apply the conversion function. And then – a YIPPEE MOMENT! I can read the pH value of the nutrient bath that is feeding my vegetables. One Op Amp will isolate reading from measuring the voltage. Sparky notes: A typical probe has an impedance of anywhere between 50MΩ and 500MΩ, and since 100MΩ*1nA=.1v even having a single stray nano amp can throw our measurement off by almost 2 entire ph units). Because a copy of the part of the circuit that gets the reading from the pH probe is used (a unity gain buffer), measuring the pH does not affect the reading of ion activity by the pH probe. The other Op Amp will amplify the tiny voltage change read in from the pH probe to a +/-5 v range. An ADC to convert the analog reading into a digital value that can be interpreted by the Arduino sketch. Total realistic pH range is 0 to 14. Generates -59.16 millivolts per pH unit at room temperature (=”Nernst potential”). Note that this is a negative slope–higher pH, lower voltage. the full scale range is +/-0.414 volts. (+/-0.05916*7), at 25 degC. Temperature coefficient of the Nerst potential is -0.001984 mV per °C. That makes the slope -54.2 millivolts per pH unit at 0 degrees Celsius, and -74.04 millivolts per pH unit at 100 degrees Celsius. I just finished my last post where I discussed the system design for my grow stations. In that post, I decided to evolve BTLE as the communication protocol between a node and the Base Station. Then the Base Station would talk to my iPhone over BTLE and 802.11, depending on if the iPhone was in range of BTLE. Keeping in mind that I am lazy, I’ve made one more leap in simplification of my design. I decided the iPhone app will have the functionality of the Base Station. Ba Ba Ba BOOMP – good bye middle man hardware! I enjoy this phase of a project. It is the time I reflect on how truly lazy I become, especially as I get older. As I thought through my passion to grow 100% of our lettuce with the least amount of effort on my part, I realized collecting and analyzing sensor readings was not a high priority use case. What was important was a plant living in an environment with the proper care and feeding. This boils down to main functions of the water node. Automatic adjustment of pH and nutrients plus a quick update on the sensor readings just to get a warm and fuzzy that the numbers are within a “normal range”. The system is less expensive, simpler, and will be faster for me to build. I will enjoy a focus on the nodes and iPhone app. A significant support challenge has been minimized. I have a lot of experience in networks not working. Of course, anyone using an 802.11 shares my experience. With the first design I had designed for 3 wireless RFs (RFM69HW, 802.11, and BTLE). Then I went down to two (802.11 and BTLE). But why stop there? Do I really need to see what the nutrient level is on a beach? While it certainly would be nice to get an alert if the pump stopped working when I am on vacation so that I can get someone to look into it, I’ll leave that to future versions. The goal of this post is to iterate on the system design of the growth station such that the iPhone incorporates the functionality of the Base Station. Here is the *new and improved* block diagram. It is far simpler! My next post will cover a breadboard version of the water node! Thanks for reading this. Any feedback you have would be greatly appreciated. Please find many things to smile about. In this post I’m going to go over the system design of the Lettuce Grow Station. I will be using Arduino + sensors + wireless + iPhone app to measure and automate the growth stage of my lettuce. I better get going since the seeds should be done with germination in a few weeks. moving my knowledge forward in the two areas – hardware/software and hydroponics – where my passion is focus. aesthetically pleasing grow station. At some point I will address a grow station that fits into my house and is pleasing to look at. This time around I am going for functional. I will need to make several iterations! easy to move around. Some of the components – the nutrient bucket and LEDs – will be too heavy to move around. At some point I’d like an AeroGrow size for growing herbs on my kitchen countertop. In fact, I have that today! The challenge is its ability to grow a salad a day. minimizing cost over robust, quick response, and important features. Adafruit, SparkFun, and OshPark for making it so easy for us DIY’rs. The amount of learning material these companies provide is staggering. They are all so approachable. Very prompt and helpful in replies. Did you see the rainbow and bright lights? Me neither. But I do see a magnificent head of butter crunch lettuce grown through hydroponics methods. This is what my grow station needs to be able to do. I am not sure what I am doing (advice craved!). There will be many iterations. But the reward for building a grow station that can grow lettuce like this is quite tasty. maintaining the right pH for a plant is extremely critical. If not, the plant will not be able to take in food. Since I like to anthropomorphize my protagonist – in this case a head of lettuce – I imagine the lettuce is like me. Extremely grumpy when not fed correctly. Only it gets worse. The poor plant is reliant on me to feed it with the right nutrients. maintaining the right nutrient level is tricky. While I’ll be taking conductivity readings and adjusting the nutrients accordingly, the conductivity readings cannot tell me which nutrients are deficit. What if the poor lettuce is lacking nitrogen yet I decide to blast it with potassium? What kind of a grower AM I? Someone should probably call the plant police on me! The amount of light is very important. My lettuce plants will need appropriate levels of LUX and PAR lighting. I like LED lighting. High powered LEDs let out a lot of light and are more efficient than others. I’m ok with paying more – although I am also interested in the difference between DIY LED fixtures and buying an equivalent. The care and maintenance of the water part of the lettuce grow station requires the most amount of time. I’ll focus on minimizing this. I will be adding more stations. After all, what is a salad without tomatoes? I want to view and control my grow station from my iPhone. My new friends can talk to me at anytime from anywhere. I want the system to be responsive. When I ask for a reading from my iPhone I don’t want to wait very long to get a response from the Base Station. Grow – these blocks include the lighting and the hydroponics system. The hydroponics system includes the parts where the plants grow and a reservoir that holds the water mixed with nutrients that the plants will feed from. Control – the control blocks receive readings for conductivity, pH, and water temperature and send this information to my iPhone. Interact – I view and act on the readings from an iPhone app that I will write. In this section I’ll give a high level explanation of the details of components in the Grow boxes. I am not quite sure what the “best” LED fixture is for my needs so I’ve been exploring several potentials. I measured the lumens using a LX1010B Light Meter . I measured the PAR value using the DIY PAR meter I purchased awhile back. I took the LUX measurement at 5″ below the center of each light. Lumens will be greater for full spectrum lights. Lights like the UFO – that have light in the blue and red wavelengths – will have less lumens but should have a higher PAR since the energy from the blue and red wavelengths are absorbed the most by plant leaves. For this reason, many see PAR readings a better representative of a light’s usefulness for plant growth. However, I do not have a PAR meter I am comfortable is accurate yet and I do not have a spectral distribution of these lights. PAR values are measured in µmolphotonsm-2s-1. I am still learning about PAR values and how much is enough for each type of plant. Also, I am not sure the DIY PAR meter has accurate results. Actually, I assume inaccuracy so I am using the DIY PAR meter readings to get a general idea and to also spark me into taking better light measurements. It looks like our seed starters have enough light. The AeroGrow keep pumping along growing a small amount of mint and basil. The UFO’s should be fine for lettuce. The high LUX measurement of the DIY LEDGroupBuy fixture makes it a better choice for my next project – A Salad A Day -> Tomatoes. Of course, the light can be adjusted to fit within a reasonable range as needed. I bought a UFO 135W from eBay for $102.50. I was curious how the PAR compared to the 90W UFO I had previously bought from eBay for $62.96. It turns out the light values are very close. The 90W was a good deal. It looks like prices have gone up since I purchased. The DIY LEDGroupBuy Fixture is something I put together using the circuit I discussed in an earlier post. I did not include an Arduino. I just plug it in with a timer and off it runs. I bought two Lumia 5.1, 1 48W power supply, and 10 LDD-700Hs from LEDGroupBuy This cost me roughly $358 – which I’ll roughly associate with 2 UFOs – means each light cost $358/2 = $179. Higher than what I will pay moving forward. I might try buying just CREE LED arrays instead of the customized Lumia 5.1’s. The price will be much lower. For now I will use the meters that I have, adding an apogee to calibrate the PAR levels. 2 4″ x 4″ x 48″ vinyl fence post. I got these at Home Depot but can’t find them online. 2″ net pots. A net pot will be used to hold each plant. Once the plants I am germinating grow roots, I will put the rock wool into a net pot and then place the net pot in one of the holes. 1/4″ PVC tubing to get the nutrient enriched water from the main tube to the top of the net pot. 1/2 inch outer diameter, 5/8″ inner diameter tubbing from SunlightSupply to go from the nutrient bucket and act as the main feeder to the per net pot tubing. The nutrients initially are pumped into this tubing and go to the end of the post. Along the way the nutrients is distributed to each net pot through the smaller diameter tubing. The tubing is very flexible to accommodate bends that I’ve got to make to get the tube to the top of the post. bucket to hold water enriched nutrients. water pump to pump the water from the bucket up through the feeder tube. Same nutrients I talked about in my previous post on the germination station. send the readings for the water temperature, pH. and conductivity upon the request of the Base Station. Respond to pH UP and DOWN adjustment commands sent from the Base Station. Respond to nutrient adjustments when sent from the Base Station. The water node will consist of a PCB, a water proof case, a probe for measuring the pH level, a probe for measuring the conductivity level, and a probe for measuring the water temperature. Atlas Scientific’s pH circuit and probe. Atlas Scientific’s conductivity circuit and probe. a DS18B20 water temperature sensor and probe . Parts such as the ATMega328P to run the Arduino Sketch. a wireless chip capable of communicating with the Base Station that is within eye sight at a maximum of 100′ away. a pump and tubing for pumping more nutrients into the nutrient reservoir when the Base Station tells it to add a specific amount of nutrients. Request and receive sensor readings from water nodes. Send commands to a water node to adjust the pH and/or nutrients (as needed). Respond to requests from the mobile client. BTLE has more momentum than other RF solutions I have been exploring. There are already consumer devices that use BTLE. I can’t say the same for RFM69HW. This means a bigger developer community which means more robust chips and firmware. Interoperability with other devices that use BTLE will be easier since the lower levels of communications are the same. I would focus on the application level communications. There are multiple supplier of BTLE chips. Because of a larger market and aging of BTLE, chip prices will go down. BTLE has a robust set of features such as RSSI, making it an easier and more robust in-home wireless protocol yet is not as heavy weight as 802.11. Lady Ada – whom I respect for her ability to select chips and trends – has jumped in with her Bluefruit offering. If it is good enough for Lady Ada…. I have written iOS apps that use BTLE between the iPhone and an Arduino. The APIs keep improving. BTLE is integrated very nicely into the iOS app ecosystem. My requirement of 100′ between a node and a Base Station can be met with BTLE. According to the wikipedia article on BTLE, the maximum distance is 160′. I don’t assume my testing will achieve this range. However 160′ is 60% greater distance than what I have specified- which should be plenty of room to meet the average communications. BLE achieved lower power consumption (10.1 uA, 3.3 V supply at 120 s interval), compared with ZigBee (15.7 uA), and ANT (28.2 uA). There are two iPhone to Base Station interactions. The first occurs when my iPhone is – you guess it! – 100′ or less from the Base Station. I’ll use BTLE for that. The second occurs when I have my iPhone at another location. For this I need Internet connectivity. I will use the ever so popular 802.11 Internet wireless protocol to enable this feature. I like the BTLE for local because there will be a better response time going directly to the iPhone instead of going through the internet. I like the 802.11 because it allows the Base Station to be positioned near the nodes while at the same time giving me “anytime/anywhere” access to the nodes. I will write an app for my iPhone that receives sensor data from the Base Station and sends commands to the Base Station. I have written many iOS apps in the past so I am confident on how I go about this. I have yet to design the interface. This is something I will wireframe soon. I have always found in distributed system designs such as this (well actually more complicated) that putting off what I see on the phone’s display, what buttons I can push, robustness, and response speed makes for a much less desirable system. I will keep iterating on the design. Please let me know what can be better – or share your thoughts. I am learning as I am going and crave advice. I just got my new soldering station. A YIPPEE! moment. I’ll be practicing my SMT soldering techniques on some practice boards. I will start putting together a prototype of this system in time for the plants currently enjoying their spa time in my Germination Station. I’m thinking about starting an Open Source PAR Meter project based on the effort and conversation on this forum thread. Hey MK, had some comments while I was reading. I better get going since the seeds should be done with germination in a few weeks. Lettuce germination should be done in 2-3 days and maybe after 7-10 days it would be ready for transplant into a system, not a few weeks! maintaining the right nutrient level is tricky. While I’ll be taking conductivity readings and adjusting the nutrients accordingly, the conductivity readings cannot tell me which nutrients are deficit. What if the poor lettuce is lacking nitrogen yet I decide to blast it with potassium? Adjusting the EC of the solution and keeping it constant (I believe I grew my lettuce at 0.5-0.6 EC) is all you need to do. To tell what nutrients are in deficit you need some very expensive and complicated ion-sensitive sensing equipment, which, given that you write that you are lazy, are likely beyond the scope of your project. It’s also worth mentioning that they are completely unnecessary. That sort of thing would be appropriate for a massive-scale commercial grower who was optimizing the economics of his operation by making sure the plants had exactly the nutrients they needed. For a simple home grow of lettuce, using a vegetative-style nutrient where the N>P and K is decently high (I think I used 3-2-5), you’ll be fine. 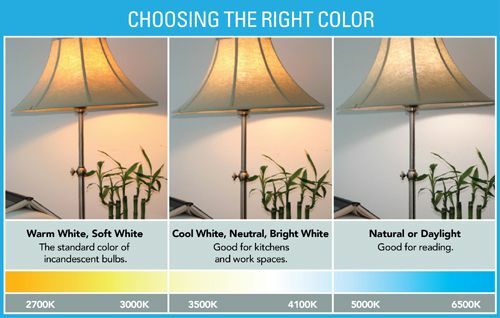 High powered LEDs let out a lot of light and are more efficient than others. I’m ok with paying more – although I am also interested in the difference between DIY LED fixtures and buying an equivalent. You’re growing lettuce which you don’t want to go through a flowering cycle. And automating time on/off is a simple $10 light timer from Home Depot/etc. As for the construction of the system, looks like you’ve got the right parts. For the electronic control, I’m really interested in it. I’d love to eventually set something up with a similar pH/EC sensor with automated control of pH. Very cool stuff. No problem, I am by no means an expert but I am happy to share some of my experiences. In my experience, when I would put a small group, say 20 lettuce seeds, between two layers of paper towel saturated with water, in a ziploc plastic bag, on a heated germination mat, I was getting close to 100% germination in 2 or 3 days. I do believe that lettuce seeds do not have great longevity; so it’s possible that if your seeds are old, or were not stored at low temperature, they may have low viability. wowzer! Sunglasses needed for your video… what LEDs did you use? luxeonstar.com, their star-shaped coolbase ones, deep blue and deep red. THANK YOU for reading this far. Please find many things to smile about.